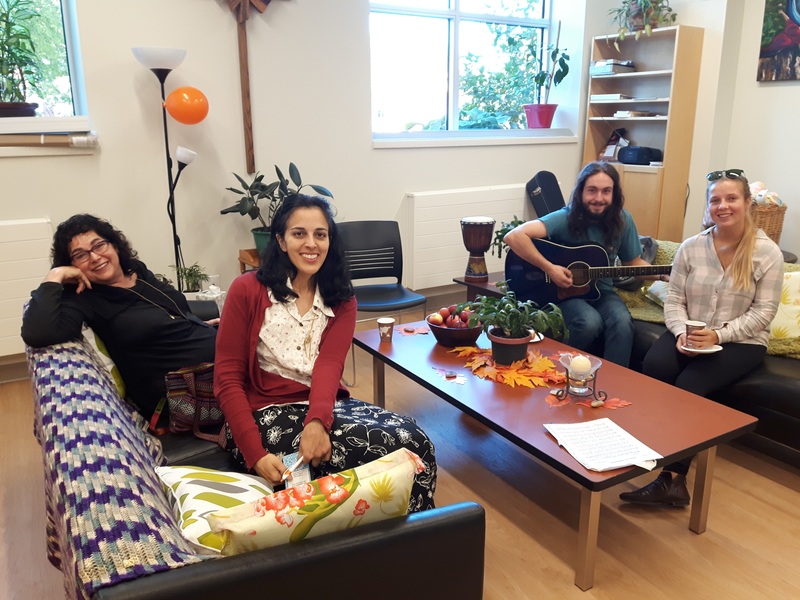 Welcome to a place of friendly fellowship, where members of Saint Paul University and the greater Ottawa community can find refuge and rest, while also discovering engaging conversation and music. At the heart of the Oasis is our water fountain, a gentle reminder of our source of living water. The haven of peace found in the Oasis is also a space for sharing, listening, accompanying, rest and tranquility. Monday to Thursday: 8:30 a.m. to 5:00 p.m.
Friday: 8:30 a.m. to 12:00 p.m.
Welcoming, celebrating, serving; these are the values that build our foundation here on campus! Feeling overwhelmed or overjoyed? The Oasis provides a friendly space where you can share your thoughts with other students, volunteers, faculty and staff. Aside from the opportunity to relax and recharge, Pastoral Services also offers liturgical celebrations and various pastoral activities. We practise principles of selflessness on campus, and we reach out to those in need in the community that surrounds us. Come meet the Oasis team in Room G028. Within the Oasis, there is a friendly and welcoming space where members of Saint Paul University and the greater Ottawa community can interact, create meaningful relationships and contribute to a vigorous University community. With a commitment to a group of vulnerable people within the Ottawa region. With the vibrancy of liturgical moments to cultivate our faith, while building our ecclesial community.